Huge inventory Sale of italmoda and Ligne Roset furniture happening now!! Stop in and see whats on the floor and inquire about what might be in the warehouse. Lots of furniture and accessories to choose from. Many items still at the warehouse, stop in and see if we have what you are looking for. We are making room for a large selection of new inventory in both stores and both locations!! Stop in the italmoda showroom today!! Many exclusive lines that are not available anywhere else in the area. Two of Metro Detroit’s Top Contemporary European Furniture retailers Now Under One Management. ~ italmoda is now managed by Ligne Roset management. 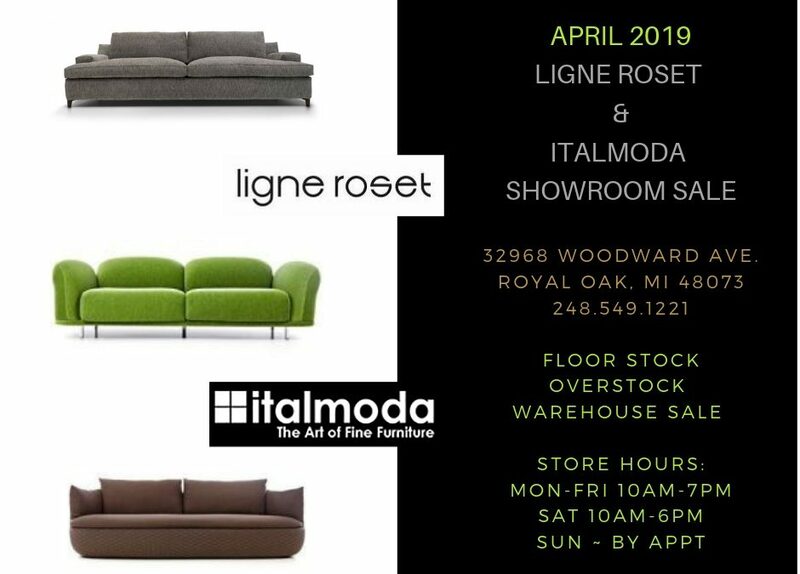 ~ New Ligne Roset location opening soon in Royal Oak on Woodward Ave.
~Stop in this month for our HUGE warehouse and showroom sale April 1st-30th.